When it is launched later this year the new Cadillac ELR will take away Tesla's exclusive claim to cool electric luxury cars. The coming Cadillac ELR, electric luxury coupe was designed to be a high tech vehicle. It is also an electric vehicle with an on-board range extender. Like all luxury cars the ELR is powerful. It is able to generate 295 ft-pounds of torque. In order to balance the torque capability and a refined feel Cadillac’s engineering staff took a holistic approach to tuning this vehicle. Torque of this magnitude through the front wheels of a vehicle can be a challenge. It has a tendency to cause the vehicle to “torque steer”, which is simply the effect of one wheel being more powerfully driven causing the vehicle to pull to one side. The effect is most noticeable when the vehicle starts off from a corner with its wheels turned. Many manufacturers now use some form of torque reduction in these cases. The effect is similar to the one produced by a limited slip differential. 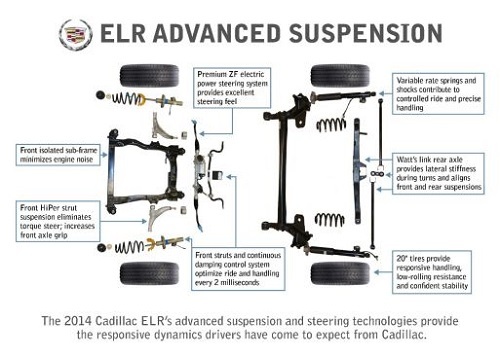 Cadillac was able to manage this issue using its HiPer strut suspension and a premium electric steering system that only uses energy when actively steered. The steering system on the ELR can even correct for crown irregularities in the road to keep the car on track without driver input. In back, Cadillac used a Watt’s link design to enable the Cadillac ELR to corner well while providing stiffness in corners. The same link also allows vertical motion of the rear suspension while keeping the rear suspension aligned with the front suspension components. Cadillac is taking chances with the coming ELR which is expected to cost about $ 60,000. For example the paddles typically used for shifting a dual clutch automatic transmission in other cars, are used to initiate regenerative braking in the ELR. Production has already started on the first test models of the ELR at the GM Hamtramck plant. Expect to see cars at dealers late this year.